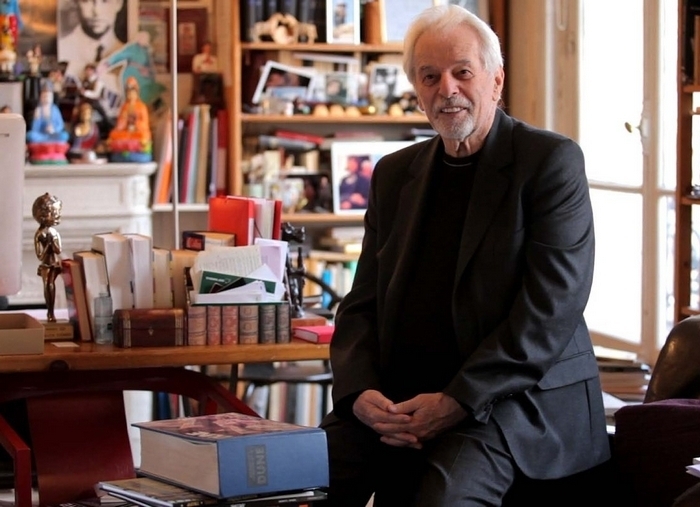 “Alejandro Jodorowsky’s Dune” is a truly delightful documentary. It’s a fact of movie life so obscure it’s almost a secret: Some filmmakers have personalities so charming, so seductive and so utterly irresistible that their true mastery is their gift for making a budgetary pitch and for assembling talent. It is possible – I don’t want to name names here – to amass filmographies full of astounding mediocrity and even rubbish by having precious little filmmaking skill but a mind-boggling talent for selling yourself and your film project. “Jodorowsky’s Dune” – one of the most delightful films by far I’ve seen all year – is about how one such prodigiously winning and ambitious film visionary almost changed film history but, even in failure, had a massive effect on modern film. He tells his tale with a semi-perpetual beatific smile that makes even his most lunatic flights of impracticality seem like some of the most delightful ideas you’ve ever heard. His commitment to artistic purity approaches religious ecstasy – all of it is wildly good humored and contagious. What zillionaire film angel could resist him, you wonder. That there are countless such zillionaires who did is no doubt traceable directly to his oeuvre – the classic “acid western” “El Topo,” which all-but-invented the “midnight movie,” and 1973’s surrealistic “The Holy Mountain.” Jodorowsky liked to be his films’ star, director, writer, producer and responsible holy family all rolled into one. In the early 1970s, quite specifically, he wanted to make a movie of Frank Herbert’s sci-fi holy book “Dune,” a book he hilariously admits now he didn’t read. It is that tale now – and how he hoped to use the making of that film to escape the artistic “prison” he felt he inhabited – that we watch with utter delight in “Jodorowsky’s Dune.” He tells it in Spanish and charmingly broken English – a man without a specific country perhaps but an impassioned and honored citizen of film. What he wound up doing is amassing fellow citizens of his dream of “Dune” and actually creating one of the damndest film scripts the world has ever seen. Sent out several places in Hollywood were various copies of a book full of drawings, paintings, storyboards, rough drafts and designs of how Jodorowsky’s “Dune” would precede, from costumes and production designs to huge action scenes. The end result, in typical Jodorowsky style, seems to combine grandeur and homemade tackiness in a way that is uniquely Jodorowsky. It is that tale of the growing, disembodied country of Jodorowsky’s “Dune” that I find as charming and irresistible as anything I’ve seen at the movies in a long time. God only knows how people resist this guy. He’s both a total delight and an absurdity at the same time. His misadventure with “Dune” goes from 2001 special effects wizard Douglas Trumbull (“not a spiritual person,” sniffs Jodorowsky in rejection, “not my spiritual warrior”) to John Carpenter’s collaborator Dan O’Bannon (“a very erudite lunatic”) to David Carradine, (who downed all of Jodorowsky’s vitamin E before saying “sure” he’d come out with the director and play). It even included surrealist genius Salvador Dali in New York’s St. Regis Hotel whose request was that he somehow be the highest-paid actor in cinema history. How Jodorowsky and his producer got Dali on board their utopian project was by realizing he would only occupy five minutes of screen time and offering to pay him more per minute of actual screen time than anyone had yet been paid. Mick Jagger walked toward Jodorowsky at a party in Paris and said “yes” to being in it. Orson Welles? The man, said Jodorowsky, who “ate the movies?” Sure. All Jodorowsky had to do was promise that mountainous Welles’ favorite chef would cater the movie. The tale is utterly hilarious until copies of that incredible script book hit Hollywood in the search for money. And, at that point, all intoxication stops. And a cold shower of reality begins. And here is where the tale of Jodorowsky’s failure suddenly turns triumphant and glorious. That script book so full of drawings, ideas and plans has been looted for individual ideas by other filmmakers for many decades – by everyone from George Lucas’ “Star Wars” to Ridley Scott’s “Alien,” “Blade Runner” and “Prometheus.” It has become, say several smart critics, part of the hidden film grammar of fantasy film in our time. Obviously film devotees will love this old guy more than other people. But I find it hard to imagine anyone seeing this movie and not rejoicing – at least a little – in a world that has the likes of Alejandro Jodorowsky in it.